Docker is an open-source engine which automates the deployment of applications as highly portable, self-sufficient containers. 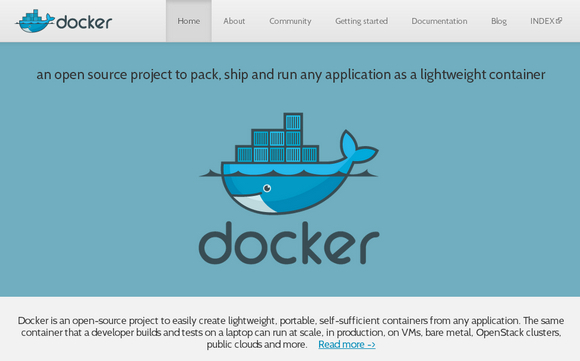 Docker containers are both hardware-agnostic and platform-agnostic. This means that they can run anywhere, from your laptop to the largest EC2 compute instance and everything in between – and they don’t require that you use a particular language, framework or packaging system. That makes them great building blocks for deploying and scaling web apps, databases and backend services without depending on a particular stack or provider. Docker is an open-source implementation of the deployment engine which powers dotCloud, a popular Platform-as-a-Service. It benefits directly from the experience accumulated over several years of large-scale operation and support of hundreds of thousands of applications and databases.